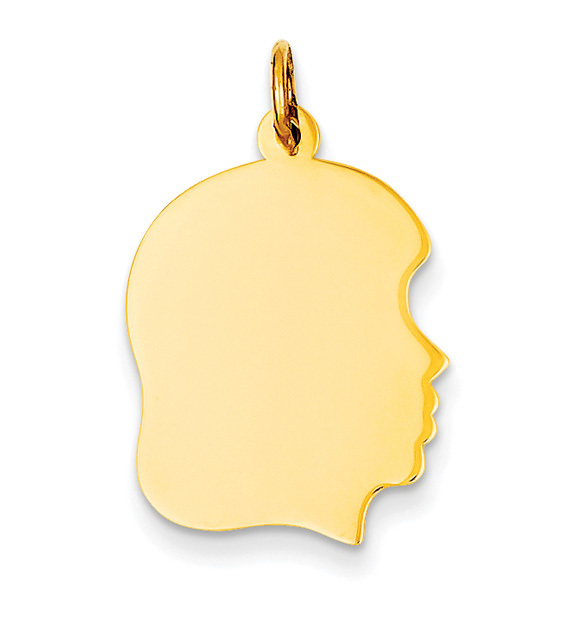 An engravable girl head charm pendant crafted in 14k solid yellow gold. The girl pendant can be personalized on both sides with engraving. Choose up to 3 lines of engraving per side with up to 10 characters per line. Simply enter your engraving above with a "/" separating each line that you would like engraving. For example: "Engraving Line 1 / Engraving Line 2 / Engraving Line 3". The girl head pendant measures just under 15/16" tall x just over 5/8" wide (or 1 1/16" tall with the hoop / bale). Add a matching 0.7mm 14k solid god box chain necklace in 18" or 20" (optional). This pendant normally ships within 1 business day (engraving may add 3-4 business days to shipping time). Also available in a boy head version or white gold, shown below. We guarantee our Engravable Girl Head Charm Pendant in 14K Gold to be high quality, authentic jewelry, as described above.